Le Petit Brevet is one of those rides that both entices and scares at the same time. I'm not getting any younger so when Scott Emmens announced he was going to organise it this year after a 3 year gap since the last one, I thought I better hop on board. The thing that you struggle with from looking at the stats, is how you can get so many vertical metres into that many kilometres. Well, all I can say is, you do. There are only about 50 kilometres of flat in the whole ride. Typical Dirt Brevet type rules apply and you have to finish inside 36 hours. 24,888 freedom feet of climbing. If you don't enjoy climbing, it's probably not for you. I was lucky to have my buddy Ian and his family host me, and quite close to the course, in Mt Pleasant. After unpacking my bike I noticed I could no longer get big/big in my gears and my rear disc was rubbing. Something must have shifted in the travel process. I decided to adjust the limit screw and reset the rear caliper. I tootled off up the hill to make sure everything was meshing, it was. Up ahead I saw a couple of MTBers so I caught up to them to say hello. The older of the two checked out my bike and asked if I was doing the LPB, as his workmate was organising it. When I asked what his name was, and he said "Guy". The penny dropped. 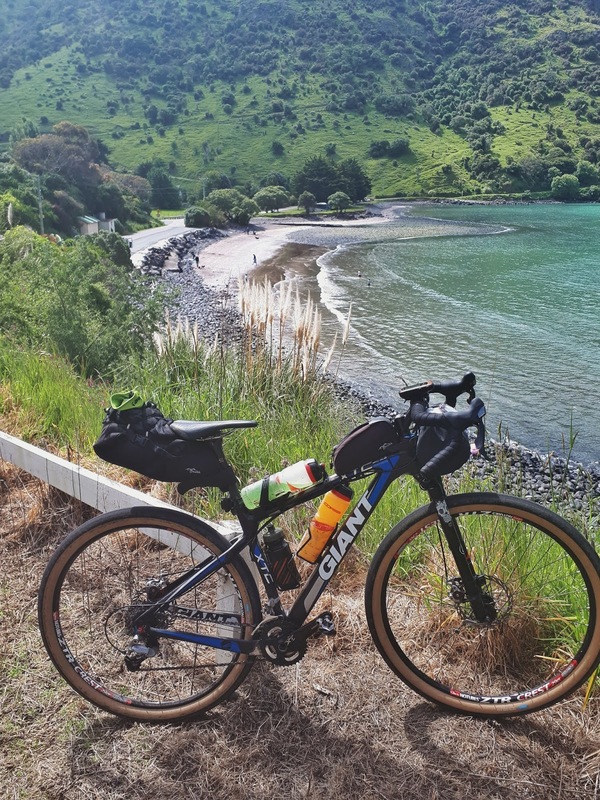 I don't think we'd met since the 2010 Kiwi Brevet when our crew came across Groundeffect's Guy Wyn-Williams and Laurence Mote heading into Darfield, or thereabouts. They had the "local knowledge" so we were happy to get on board with their suggestion of a pretty comfy spot sleeping on the porch at the Oxford Pony Club Domain. The funny part was when they got a small head start on us in the morning and we watched them cycle down the road and take a wrong turn in front of us! I don't think we saw them again. Small world anyway! 22 nervous riders, wondering what they just signed up for. I digress. The next morning Ian and Lucy kindly dropped me off at Hansen Park where around 22 riders nervously waited for the start. Someone named "Tad" hadn't turned up, but he was on the list, so we waited a bit longer and eventually left without him. There was the usual array of completely different bikes, all of which would be perfect for the job at one stage or another during the ride. I was seriously doubtful of the kit that some people were carrying. 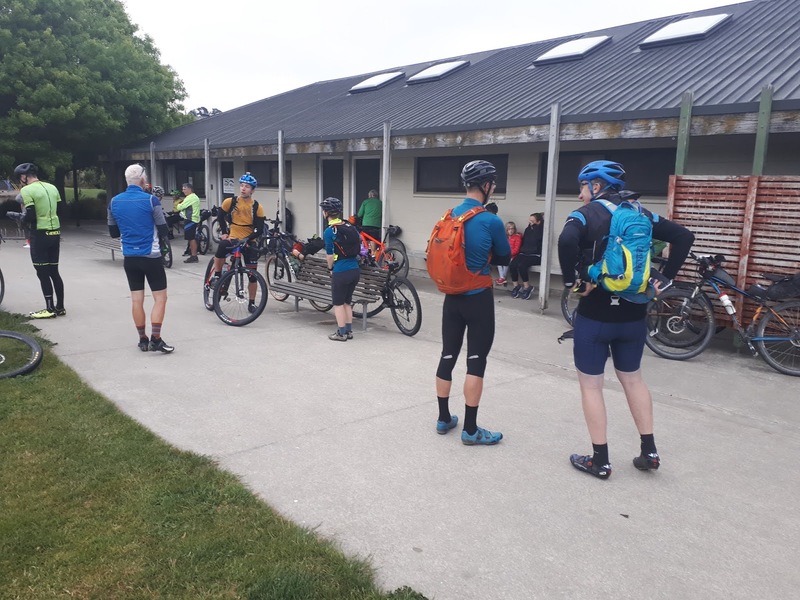 They either had their mum waiting ahead fluffing the cushions for them in Akaroa, or they were planning on having balmy weather for the whole ride. As usual I was packing my fears, with a puffer jacket, buff, beanie, rain pants bivvy sack and quite a few other things I considered bare essentials in case I had to sleep on the roadside. The initial pace was a bit hot I have to say, and eventually I found out it was crusty Andy the Badger Beale who was the culprit. 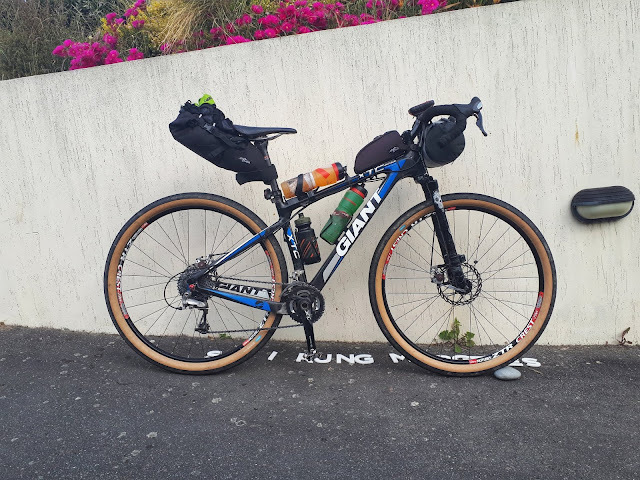 I struggled a bit on my rigid drop barred bike as we entered Kennedy's Bush, but the single track there was the only single-track I did at pace anyway. 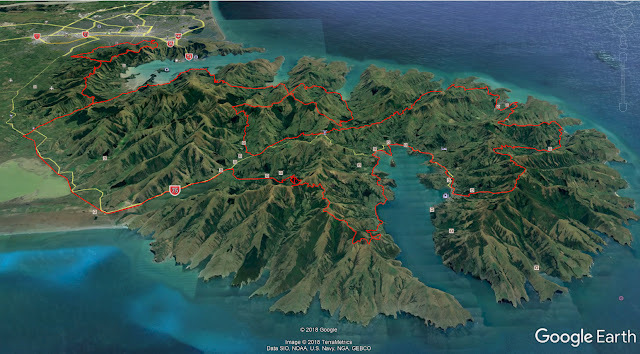 I ended up riding with fellow Wellingtonian Dr Nick Kennedy. 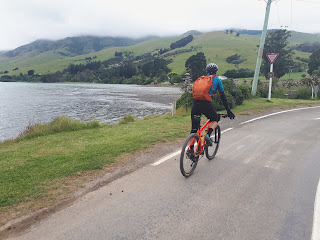 Nick is pretty fit so I asked him lots of leading questions about his medical specialty to make it harder for him to pedal and talk at the same time. Nick countered by asking me at what point old people noticed a measurable decline in their performance - he was about to find out. Nick had spent a bit of time in Christchurch so he had a bit of local knowledge and was nailing the sealed descents we rode early on. We stopped at the first cafe we saw and Nick quickly downed a pie and a coffee. I hadn't developed a desire to eat at this point so I stowed a couple of pies in my back pack. Nick Kennedy. On a sensible bike. Cannondale hard Tail. We carried on at a pretty good pace and got through a fair bit of climbing. The climbing was pretty constant. There were two main types of climbs. Steep, and bloody steep. After a while I pretty much stopped even using my big ring, just to save the hassle of changing gears. My little gear of 24 on the front was not that much smaller than the big gear of some of the 1x set-ups out there anyway. 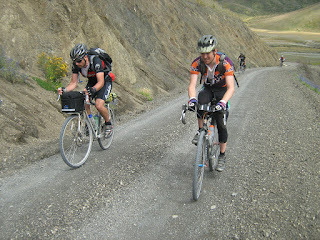 Eventually we got back onto some gravel, some really steep gravel, I suspect it was Pettigrews road. We had been riding very solidly for about 70 kms at this point. I was using my new Compass Antelope Hill 2 inch slicks, and even on this crazy steep stuff there were no problems with traction. We did see Andy Beale up ahead, pushing his bike up the road. Probably a victim of his early pace and his big front ring. After about 5 minutes it turned out that riding was marginally quicker than walking, and we caught him. He was in good spirits and was fun to ride and walk with for a bit. He was on a hard-tail like Nick so as soon as we hit the off-road leading into the Double Fenceline track I told them to go on, as I seemed to be in energy deficit and I needed to get one of those pies circulating through my system. Taking a breather before the Double Fenceline Track. My first pie still had little attraction for me but I forced most of it down and left the rest for the birds. It was good to take my first "breather" in about 4 hours, and after that I concentrated on taking a few photos. There was a small problem. The higher I got, the better the views were expected to be, but the tops were often enclosed in cloud. On the other hand, if it had been full sun the whole time it would have been even more brutal. Stiles were the reason I didn't put all my gear in a frame-bag. 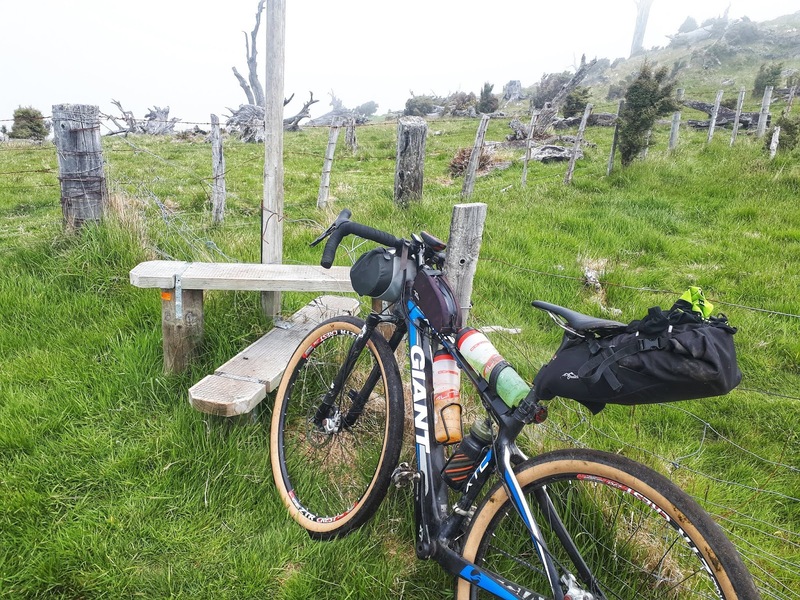 The Double Fenceline track wasn't particularly enjoyable for me, and my bike seemed to be getting heavier with each stile. I was surprised to see people out riding this trail for fun. The going was very slow, but after a very long time (2.5 hours) I was temporarily down on the flat again making a 2km return diversion to the Little River gas station to stock up on fresh Pies and Lolly-water. On the return I had my head down and after climbing 2 kms up SH75 I realised I had missed the turn off to Puaha Road. DOH ! Another pie stop after a foolish distraction on the smooth tarseal. What was I thinking? I need more kms? 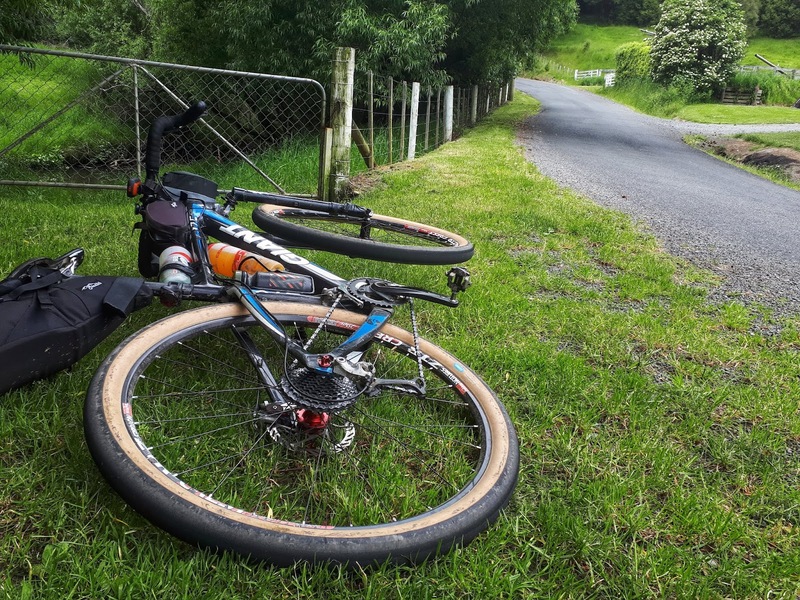 I stopped a little way down Puaha road for a break and to get some food in before the next major ascent started. A lot of the climbs so far seemed to be around 6 to 11 %, and I think there was only one of the 10 major ones that was under 400 metres (1400 feet). Little Akaloa was beautiful, with amazing views all the way around to Okains bay. Heading up along towards the Double Fenceline track. I think.... Looking out over Duvachelle Bay. 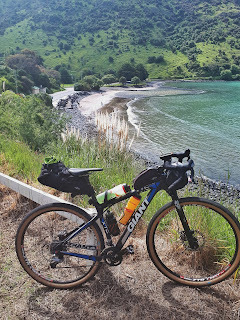 As I was just about to get stuck into "Big Hill" coming out of Okains bay, I met up with another rider, Andrew Laurie. 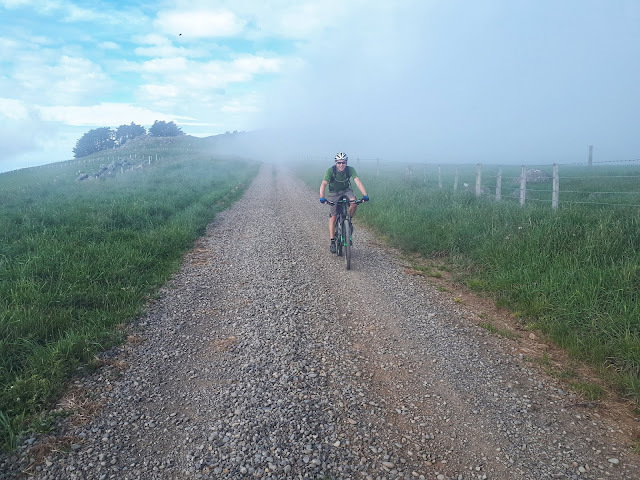 Of course, I didn't know it was Big Hill, and Andrew was surprised to see me, not knowing that he had passed me when I'd taken my 4km diversion up SH75. 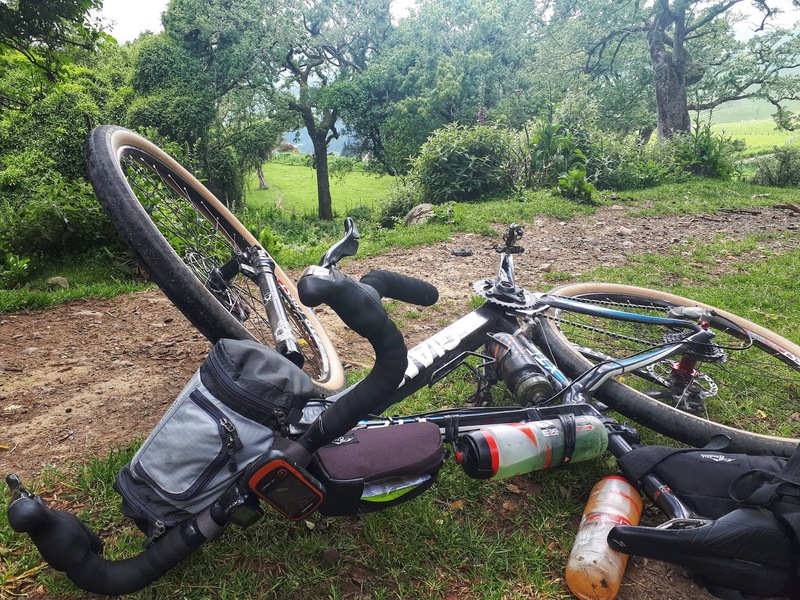 Andrew and I enjoyed riding together for a good while, but his head was a lot stronger than mine and I had to drop off the back when I ran out of concrete pills on a particular climb. Andrew seemed to know quite a few of the climbs which was helpful. I got seriously flummoxed at this point. I was making hard work of the directions on the cue sheet, and how they related to where I was going. I back tracked a few metres and eventually worked out that I shouldn't have crossed the style. I had just jumped onto the correct trail when I was surprised by a rider coming up behind me. It turns out he had missed the start by an hour, starting at 8am. He wasn't carrying much gear, in fact, he wasn't even using gears. It was Tad. Some how I put two and two together and worked out that he was the guy we were waiting for at the start, and he was the World Singlespeed champion! Cripes, riding that course on a single speed sounded like the definition of insanity. He admitted to doing a bit of walking. He was on a very cool purple rigid Surly Karate Monkey. I was trying to pick his accent thinking that maybe he was Irish, but it transpired that he was originally Czech but has been in NZ for some years. 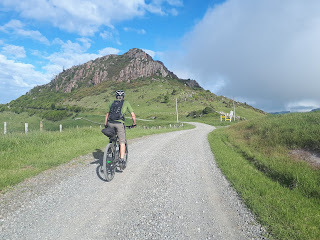 There must be something about Czechs as there was another on the ride, Martin, currently living in Nelson. At the beginning of the ride we laughed about how difficult it was for Martin to get a visa while a Czech drug dealer currently in jail had no problem getting his okayed! 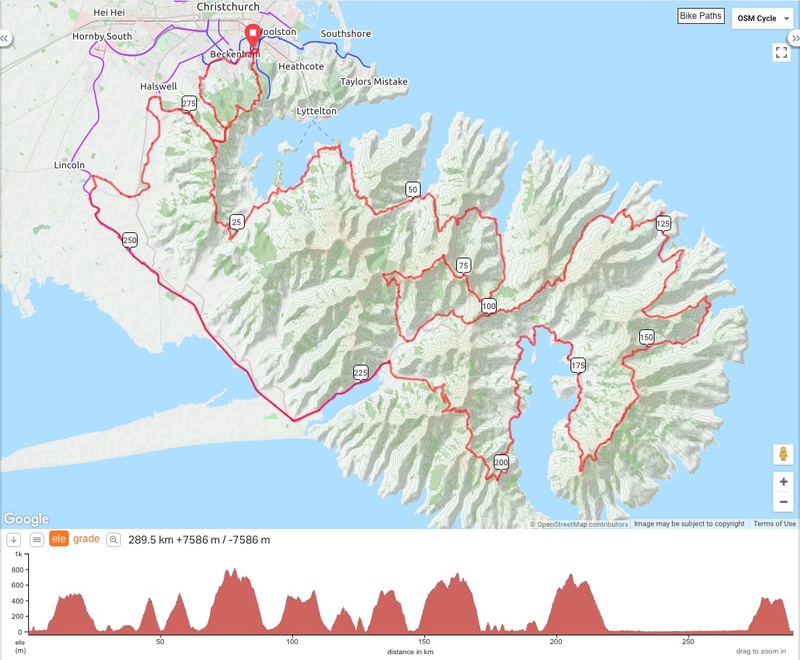 The Purple Peak Stock Track trail down into Akaroa wasn't exactly flowy and I was starting to despair of getting into town before the shops closed. I got in at just after 8pm I think and was lucky to find a fish and chip shop that while it was officially closed, took pity on me and took my 37$ for a scoop of chips and fish, 2x Powerade, 2x juice and a couple of water bottles. I was so intent on getting food that I hadn't really thought much about the option of staying the night in Akaroa. 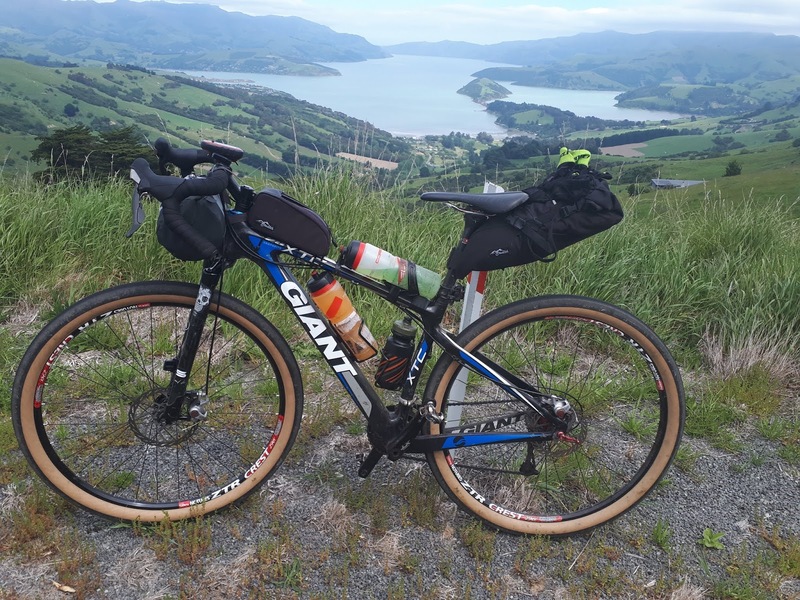 It made a lot of sense, but I hadn't booked anything, and I had come with the intention of riding through, even though I knew that I was very under trained for that kind of an effort. I figured that if I wanted to I could have got accommodation, or if I blew up spectacularly in the last leg I could jump in my bivvy sack in a hedge somewhere. The last "leg" was around 100 kms and I would be doing it in the dark. From memory it had 2 large hills in it. I figured that if I took enough food and rested up if I needed to, I could get through, and there was the promise of... joy of joy, some flat riding before the hills. So I turned on my head-light and rolled out of Akaroa at about 9pm and bang, straight into some more hills.... I saw a sign on the side of the road that said "Camping Ground"... I weakened for a moment..... no turning back now. I lapped up the flat stuff when I eventually got to it (after the first major hill) and I'm pretty sure I even had a tail wind. Before long I was climbing again and seeing up close what a massive problem we have with Possums. I must have seen at least 50 on the trails. 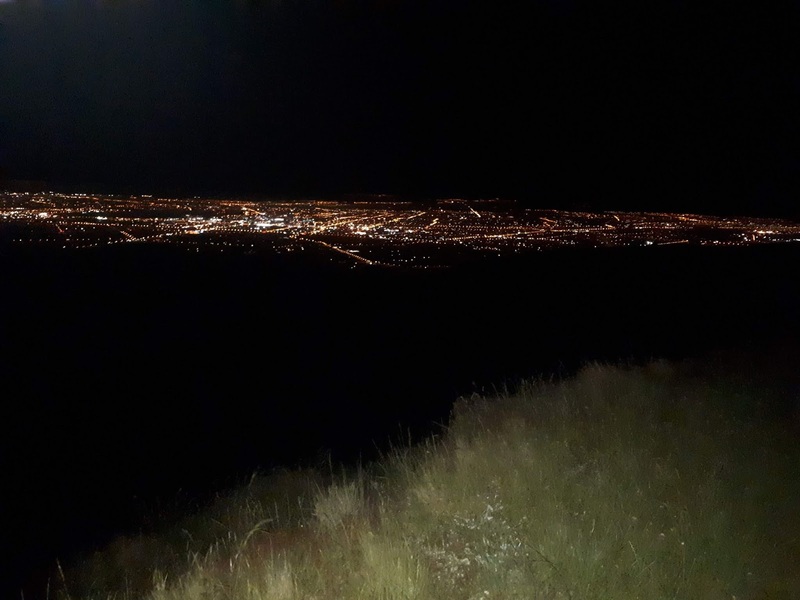 The problem with riding in the dark is that there is not much to see. I was starting to get bored and it was messing with my motivation. There was still a lot of climbing happening. Funnily, for someone who loves climbing, I had for the first time in my life discovered there was such a thing as too much climbing. I remembered my phone, I was Stravaing the ride so I had brought two sets of 2x18650 DIY power-banks for it. For the first time ever I was using the phone in airplane mode and was amazed at how little battery it was using. I turned on my Podcast app, if I jammed the phone in the top pocket of my pack's strap I could hear it loud and clear, and it was less intrusive than headhones. For the rest of the ride I treated myself to stories on such diverse subjects as Lab-grown meat, Fake illegally imported aphrodisiacs, to a critique of Madonna's album "Like a Prayer". It was getting cold so I started wearing my buff, and even put my emergency shower cap on, as well as my rain jacket, for the cold descents. 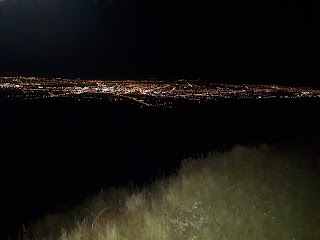 The lights of Christchurch came into view, and then the day started to break. I've only even ridden into the morning once before, and it is quite a buzz. The only problem I had with navigation the whole time was getting back to Ian's house at the end, using Google maps. Scotts LPB GPX file was perfect. So good in fact, that most of the time I am ashamed to admit that I just followed the line and didn't need to use the cue sheets at all. I had no idea who else had ridden through the night like I had, only 3 other nutters as it transpired, and unlike me, they hadn't mucked around. First in was Josh Aldridge in a mind blowing time of 14 hours and 56 minutes, he had finished by 10 pm ! That is insane. Next was another Nelsonian, the Czech Martin Strelka finishing at 11:40 pm. His ride was very impressive, on a very nice looking Salsa Cut-throat. Then there was Andy Beale at 1:44 am. I'm not sure what I was doing in the 3 hours between Andy and my time, I guess just riding very slowly ! The other 15 riders that followed the exact course finished the next day. Plastic fantastic with bald tires, Compass Antelope Hills. I've done a few interesting one-day rides over the years, but none as hard as this one. If you love the hills, are up for a challenge and want to take in some amazing views, then Le Petit Brevet just might be for you. Scott did a great job organising this for us, thanks again Scott!